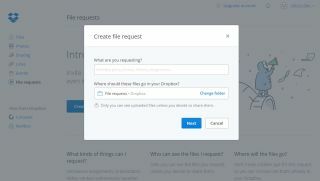 Dropbox unveiled a new feature called file request that allows almost anyone, on any platform to send almost anything from any device. This clever addition, Dropbox noted, followed a survey that found out that nearly two thirds of its users underlined the fact that they needed to collect files from others at least once in the last year with nearly a quarter of them having to do that at least once a week. Dropbox Basic and Pro users can send out file requests via a simple form which recipients can then use to send back requested files. Dropbox for Business customers will get the new feature over the next few weeks according to a press statement. "File requests" does not require the file senders to have a Dropbox account and can receive files as large as 2GB. Obviously, the files can be collated but can't be accessed by those sending the files. Dropbox claims to have more than two billion sharing connections on Dropbox with more than a quarter million users joining or creating shared folders on Dropbox on a daily basis. This latest announcement comes a few weeks after Dropbox teamed up with Microsoft to integrate Office Online.